Professional coaches provide an ongoing partnership designed to help clients produce fulfilling results in their personal and professional lives. Coaches help people improve their performances and enhance the quality of their lives. Coaches are trained to listen, to observe and to customize their approach to client needs. They seek to elicit solutions and strategies from the client; they believe the client is naturally creative and resourceful. The coach’s job is to provide support to enhance the skills, resources and creativity that the client already has. Coaching services received from Certified Life Coach, Ellen Stewart, The Pushy Broad from the Bronx are not offered as a substitute for professional mental health care or medical care and are not intended to diagnose, treat or cure any mental health or medical conditions. The Pushy Broad from the Bronx is not acting as a mental health counselor or a medical professional. 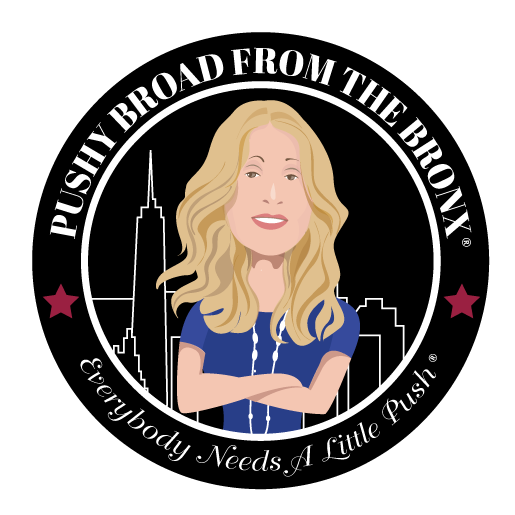 All comments, ideas courses and coaching services offered by Ellen Stewart, the Pushy Broad from the Bronx are solely for the purpose of aiding her audience in achieving their goals and hopefully keep you smiling in the process!